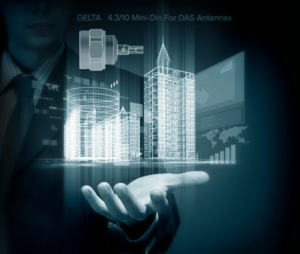 Delta Electronics is a leading global provider of innovative RF, microwave and millimeter wave interconnect solutions. They are proud to deliver a world-class customer experience. Below you will find Delta’s extensive catalog of over 330 pages. MIL-PRF-39012 QPL cable connectors are divided into categories which the characteristics of their cable assembly method, and in some cases the actual assembly method. Category A: Field-serviceable, with no special tools required for assembly. Our Category A connectors in series BNC, N, and TNC are standard military-clamp types; Category A connectors in SMA series are solder type. Category B: Special tools may be required for assembly. Our Category B connectors in N series are crimp types which use standard, commercially-available crimp tools. Category C: Crimp-type connectors which can be assembled with tools and die sizes. 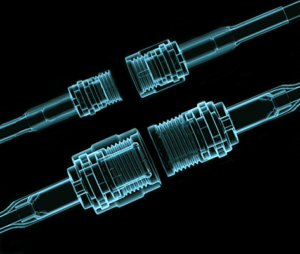 Category D: Crimp-type connectors which can be assembled with tools and die sizes, and also have sizes for crimp sleeves, contacts, and other parts. Category D connectors have crimpable center contacts. Fidelity+ provides a connection system with its focus on the consumer experience. Our IEM product design innovations have been created to support the rigors of the user and the environment. “Flex with Integrity” into tomorrow. 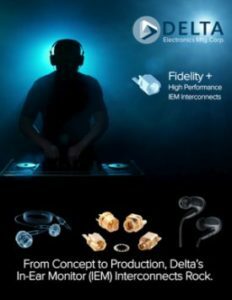 With Delta’s performance enhanced custom IEM designs, innovators will enjoy reliable engineered connection solutions that contribute to signal clarity, with repeatability. 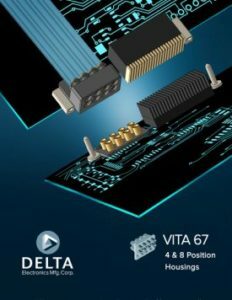 Delta Electronics Manufacturing Corp. introduces 4 position (VITA 67.1) and 8 position (VITA 67.2) RF connector housings designed for 3U and 6U formats within the OpenVPX ™ architecture. 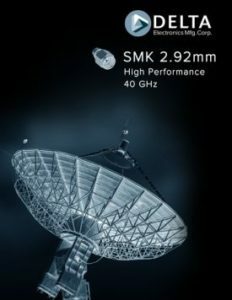 Ideal for blind mating daughtercards to motherboards, the SMPM RF contacts provide +/- .010” radial misalignment tolerance and excellent return loss up to 40 GHz. Precision machined from either stainless steel or aluminum, the 4 and 8 position housings are available with pre-loaded SMPM adapters or a cost effective, direct snap-in, cable mount SMPM contact. The right angle daughtercard solutions are offered with the direct snap-in SMPM contacts designed for both .047” and .086” flexible semi-rigid cable. When Real Estate is an issue, Gang Mounts are the ultimate space savers. 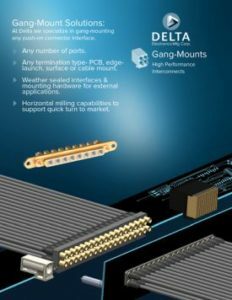 It could be a space concern on your PCB or backplane, and or, the need to have or deal with mis-alignment, Delta’s Design Solutions are the answer! 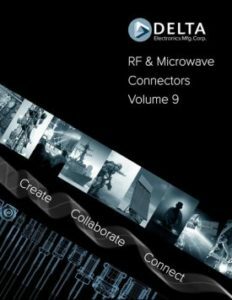 Multiple RF/Microwave & Millimeter Wave interconnections available in restricted package spacing are now achievable. Delta SSMC connectors are microminiature, 50Ω impedance connectors with 6-40 threaded coupling. 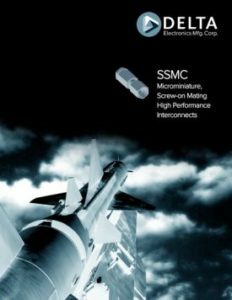 SSMC connectors are ideal for use in limited-space applications that require the rugged design of a threaded coupling interface. They are best suited for use with semi-rigid cables or miniature cables in demanding applications up to 12.4 GHz. Our extensive line of receptacles contains a variety of mounting urations and contact / insulator terminations perfect for any packaging requirements. Our adapters are available in both in-series and between series. 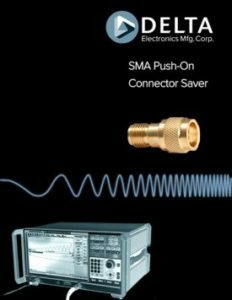 We also o an adapter with a slide-on version of the SSMC interface that is ideal for testing components; reducing wear and tear on mounted connectors and saving time on mating and unmating of test cables. 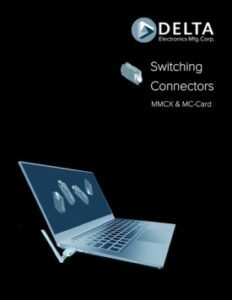 SMP & SMPM connectors are excellent choices for PC board to board interconnects, as well as module to module interconnects. The unique interface constructions allow for minimal electrical degradation when maximum misalignment occurs. 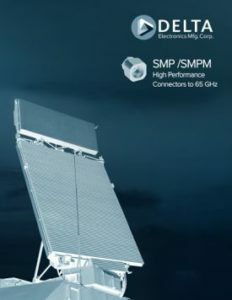 heir overall profile allows for system designers to fit these interconnects in to tighter packaging than the majority of micro-minature RF connectors. Both the SMP and SMPM come in a variety of configurations, each with specific features for whatever engineering challenge a designer is facing. 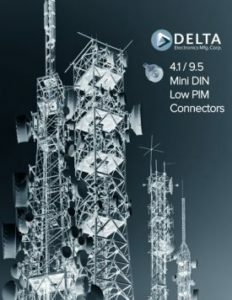 Their overall profile allows for system designers to fit these interconnects in to tighter packaging than the majority of micro-minature RF connectors. Both the SMP and SMPM come in a variety of configurations, each with specific features for whatever engineering challenge a designer is facing. 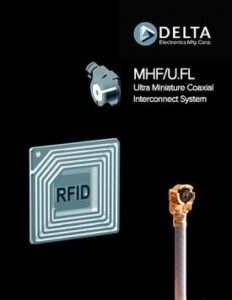 Delta introduces two new series of connectors that extend SMA performance beyond the MIL-PRF-39012 upper frequency limit of 18 GHz, while maintaining MIL-STD-348 mating characteristics for backward compatibility with standard SMA connectors when required. 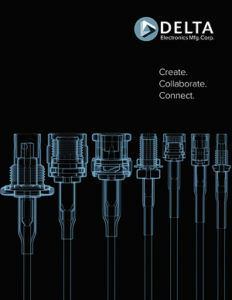 Delta MCX connectors are subminiature, 50Ω impedance connectors with snap-on coupling. They are best suited for use with cables in the range of .070″ to .120″ diameter, such as RG-178 and RG-316/U. These microminiature switching connectors automatically switch from an internal circuit and an external circuit when mated. 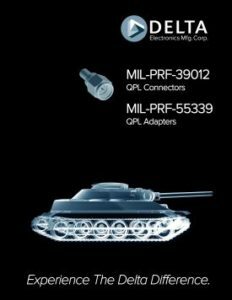 They are ideal for use in applications such as portable computers operating in wireless networks, allowing for automatic switching between the internal antenna and a higher gain external antenna. Their frequency range is DC–3 GHz when switched to internal circuits and DC–8.5 GHz when switched to external circuits. They are compatible with all MC-Card and MMCX plugs. Connectors are only as good as their plating, and that’s why we decided this important process needed to be on-site. 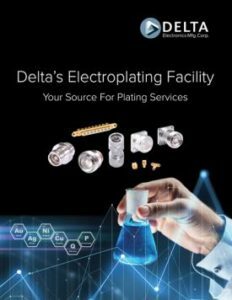 Having our own plating line, yields high quality, low costs, and reduced lead times. Call us for your electroplating needs. 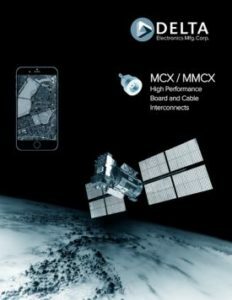 From avionics to audio, radar to robotics, Delta delivers precision interconnect and innovative solutions to a broad range of industries where reliability, performance, and durability are of paramount importance. Delta products are found in mission-critical systems across our nation’s armed services, and platforms including homeland security, border control and NATO. From avionics to audio, radar to robotics, Delta delivers precision interconnect and innovative solutions to a broad range of industries where reliability, performance, and durability are of paramount importance. Delta products are found in mission-critical systems across our nation’s armed services, and platforms including homeland security, border control and NATO.